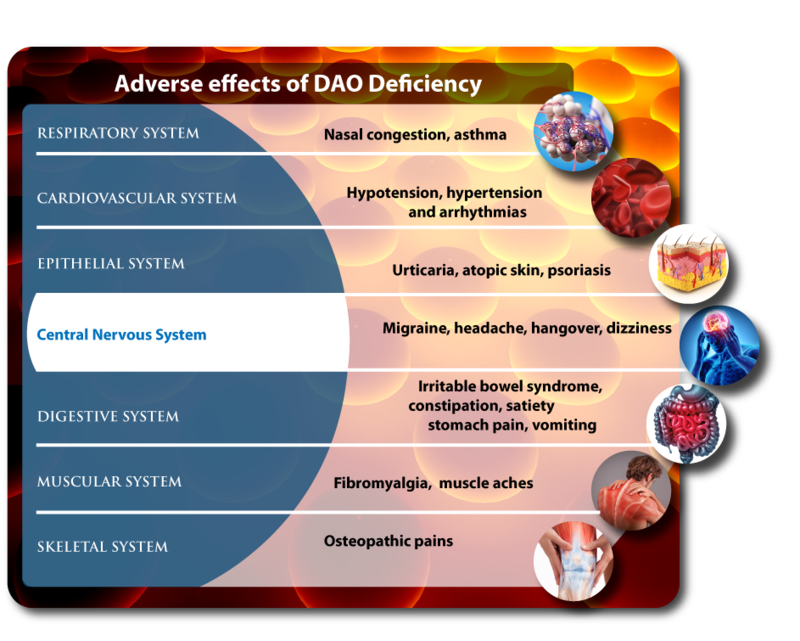 DAO Deficiency is an alteration in the metabolism of food histamine that appears when Diamine Oxidase (DAO) enzyme activity is low. In other words, when for some reason there is a significant deficiency in the functional activity of the main enzyme in the metabolism of histamine. The imbalance between ingested histamine and the histamine released from the histamine storage cells, and the capacity for histamine degradation, leads to histamine accumulation in plasma. It triggers the occurrence of adverse effects on health. 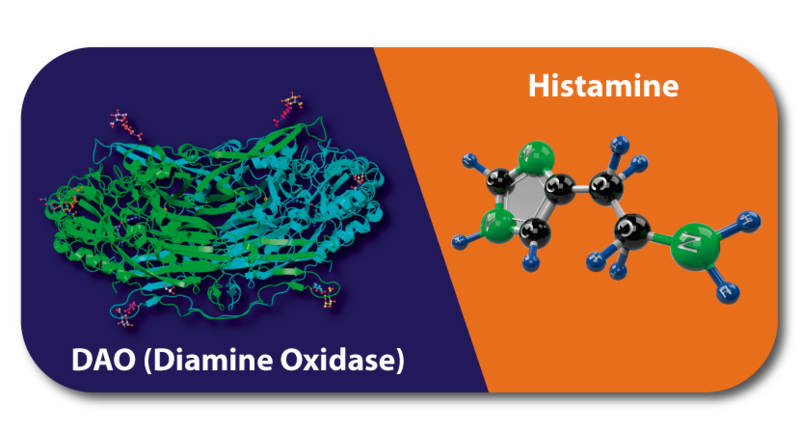 In healthy people, histamine taken with food is degraded quickly by Diamine Oxidase (DAO) enzyme, but people with low functional DAO activity have the risk of suffering histamine intolerance or food histaminosis. Unlike food allergy, the occurrence of symptoms or adverse effects is not linked to the intake of specific food; not only can it be related to a wide variety of food with different histamine contents, symptoms can also occur even after the ingestion of products with low histamine levels. This imposed considerable difficulty when establishing a maximum tolerable dose; in fact, there is no clear consensus on this value. Values that range from 50mg of histamine (in one serving of wine, 125ml, for example) to 60-75mg, prior pure histamine administration, have been listed as triggers of DAO Deficiency symptoms. Due to the wide variety of symptoms derived from DAO Deficiency, which represent chronic pathologies with a high prevalence in population, immediate research and advances on its origin and possible treatments are required. It is not necessary for all symptoms to manifest, although most patients with low functional DAO activity present an average of three of those symptoms, being migraine the prevalent one. 20% of patients experience 1 or 2 of these associated symptoms, 41.3% of patients experience 3 or 4 of these symptoms and 33.8% present more than 5. Migraine and other vascular headaches. Gastrointestinal disorders, especially those associated with irritable bowel syndrome, such as constipation, diarrhea, satiety, flatulence or swollen feeling. Dermatological disorders such as dry skin, atopy or psoriasis. In childhood and adolescence, DAO deficiency has been linked to attention deficit and hyperactivity disorder (ADHD). 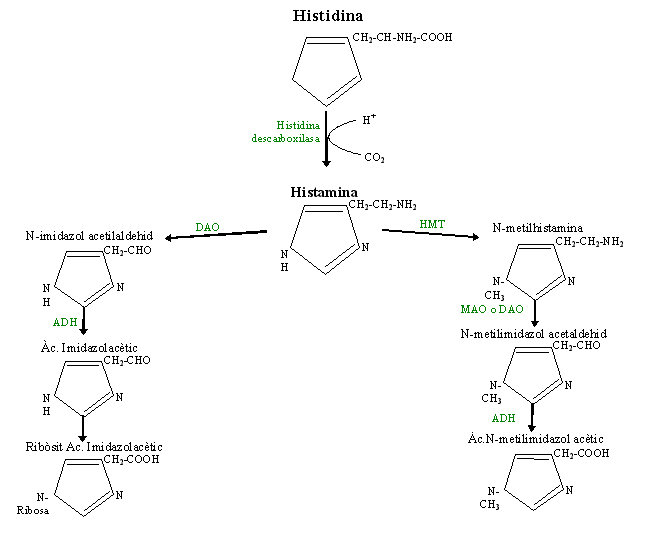 In the metabolism of histamine, when it should be degraded by DAO enzyme in order to become N-acetyl aldehyde imidazole, an accumulation of the amine is produced due to the lack of enzyme in the intestinal mucosa cells. Low enzyme activity causes the concentration of histamine, which comes from the food and is generally considered normal, not to be metabolized and a transepithelial permeation of exogenous histamine occurs. This way, histamine enters the bloodstream increasing its plasma concentration and once located in blood it spreads throughout the body.  International Society of DAO Deficiency promotes the progress of science and industry in favor of population affected by this metabolic disorder. When you visit our website, it can store information via its web browser specific services, usually in the form of cookies. Here you can change your privacy preferences. It should be noted that the blocking of some types of cookies may affect your experience on our web site and the services we can offer you. You can see our cookies policy here.